CBC's At Issue Panel had their season finale last week, and while there was no bombshell cliff-hanger (Is Chantal Hebert the final cylon? Tune in this September...), it did make for enjoyable TV, or podcasting. Here's the recap of what their panel said, with my two cents tossed in - if nothing else, it's a good excuse to look back on the first half of the 2008 political calendar. Given the way the past few months have gone, I think you've got to pick a Tory scandal, and Bernier's leave-behind affair was certainly the most bone-headed move of the bunch. I'd also nominate the somewhat misguided Tory response strategy to the In-and-Out warrants being made public. First of all Rex, I'm not sure all the Tory scandals necessarily constitute a "good play" for the Liberals, especially since it's debatable how effectively the grits have made them stick. I'm going to side with Gregg on this one - Harper displayed tactical brilliance in taking one of his largest negative issues off the table and he deserves full credit for that. Maxime Bernier? I'll give Coyne credit for going outside the box on this one and so long as Bernier isn't the biggest idiot in Ottawa, there may be some truth to it. As for the other selections, it certainly is interesting to see four three Tory Cabinet Ministers on this list, despite the widely held belief that Harper lacks front-bench strength. As for my pick? Well, after his shocking election landslide this spring, maybe Ed Stelmach. Maybe it was the appetite for change in Alberta that was underrated, but maybe Special Ed deserves some (begrudging) praise for pulling it off. While Coyne's selection of Bernier as being underrated was intriguing, Rex's selection of Bernier as being overrated just shows he has trouble grasping what exactly "overrated" means. Choosing "strategic genius" Harper and calling out of the "chess versus checkers" media narrative is certainly a worthy choice, but I'd nominate another party leader - Gilles Duceppe. Since the 2006 election, he's seen his pet issues taken off the table, had a one day run for PQ leadership, lost badly in three by elections, and sounded like a complete fool nearly every time he's opened his mouth. Yet few are willing to criticize his leadership, simply because of an artificial seat bump in 2004 and 2006, courtesy of Adscam and little else. Like all good season finales this one will be a two-parter. Tune in tomorrow for the thrilling conclusion. The best of Colbert's green screen "make McCain exciting" contest. I've watched this one a dozen times already and keep laughing every time. Question Period was hyping Jack Layton's new radio "attack ad" today (not yet up on NDP website...way to stay on top of things guys). Although the ad itself is rather harmless, it appears to be running in only Northern Ontario, the same region targeted in the last NDP ad buy. And if you look at the last election results, you'll see why. Of the ten seats there, the Dippers hold two and are in play in six others. The verdict on Monsieur Gomery, my friends, is not pretty. As Wells correctly points out, this is the final blow in completely discrediting the Gomery circus. That's not to say this proves that Adscam was no big deal (it was). Or that the inquiry should never have been called (it shouldn't have). But it does mean that Gomery's conclusions are pretty much worthless. Well, maybe not "worthless", but "westmount cheap" at the very least. Kevin Taft made it official today, announcing that he will step down as leader of the Alberta grits by January at the latest. I suspect the media evaluations of his time as leader will be mixed – after all, he leaves the party with only two more seats than he inherited and many members are talking openly about disbanding the Alberta Liberal Party altogether. But as someone who has been active at the party level during Kevin’s time as leader, I have nothing but good things to say about him. Kevin and his wife Jeanette have poured their entire lives into the ALP, driving across Alberta and meeting with anyone who wanted to (or didn’t want to) talk with them. I’m not sure if the man has slept at all over the past four years. And, although some will disagree, I believe his accomplishments have been tangible. The party debt has been greatly reduced, while membership and fundraising numbers have increased significantly. The ALP was treated more seriously by the media during the last election than they have been at any time in the past decade, and the party’s leadership will be far more sought after this time than it was during the laughable 2004 race that gave Taft the top job. The man would have made a great Premier but, for a variety of reasons, just never connected with Albertans. Even though I’m not in Alberta any more, I am curious to see how things play out there, which means I’m expecting e-mail updates from my Alberta readers to feed my cravings for leadership and party reform gossip. And since I know Albertans love nothing more than to have people from Ontario comment on Alberta politics in a know-it-all condescending tone, I’ll be sure to post frequently on the leadership race and will profile all the declared candidates. 'Tis the season to shuffle, and Harper is set to do the dance tomorrow. According to the Globe, Emerson will stay in Foreign Affairs (take a bow, the 29% of you who called it) - if you can't find a competent Conservative, might as well turn to a Liberal. It sounds like Christian Paradis, who I would have a hard time picking out of a lineup, gets promoted to public works, proving the age-old adage "good things come to those who do not date Julie Couillard". That means Senator Fortier replaces Emerson in international trade. Should there be any surprises tomorrow (Anders to Foreign Affairs pleeeeeeease! ), I'll be sure to post them, but after a glitzy scandal, I think a low key shuffle like this is probably what Harper is looking for. UPDATE: High of 28 in Ottawa today, but I'm expecting we won't be seeing much skin at this swearing in. If we do, you can bet Kady will have the full details in her live blog of the events. And it appears James Moore is finally getting into Cabinet as a Secretary of State, after being forced to grin and bear it on the Cadman file for months. Certainly a well deserved, and somewhat belated, appointment. Helpful tip to tell “Green Shift” apart from “The Green Shift”: Green shift logo is a ladybug. 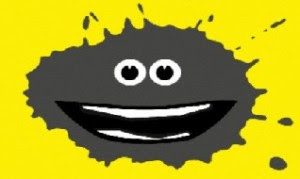 The Green Shift logo is a smiling oil splotch. As much as I hate plugging events on this blog, the Young Liberal Western Caucus (AKA “Camp Wanna Be Free”, pending a lawsuit from The Monkeys) is coming up July 11th-13th and, since it’s in Alberta and I’ll be missing it, I’ve been guilted into a post on it. -Special guest Bob Rae, and a lake…who knows what will happen! The final group has the best solution: start all over, with or without the Liberal party apparatus supporting the effort. Invite everyone from Preston Manning to Roy Romanow to discuss how they led change. More important, have an honest, open discussion with Albertans about the kind of change they want to see: fiscally conservative and socially responsible? Ask them what could be improved in the province: less corruption and cronyism, a bolder vision for the future, much more environmental responsibility? Use the results to form something new. My guess is that it will look a lot like the current Alberta Liberals, whose platform was always much more popular than their party, but maybe not. What I do know is that it will reflect what voters want, not what elites think they should have. The headlines range from "Dion Delivers" to "The Great Carbon Swindle". 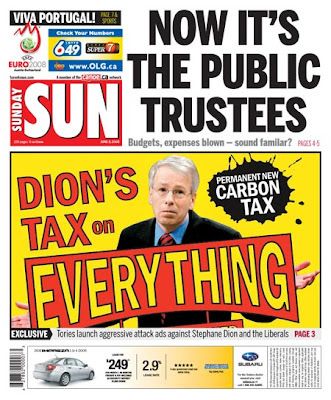 In the Star, Chantal Hebert's story runs a “Dion Election Platform Built on Carbon” headline – I hope not, because he could wind up paying a lot of taxes on it if that’s the case. And while Hebert is not quite ready to phone up Cherniak for a membership in the Stephane Dion fan club, she does call his speech “his best public performance to date as leader”. The unabashedly pro-Liberal Globe & Mail describes the plan as "daring and perhaps foolhardy" in a mostly negative editorial. Jeffrey Simpson is more bullish on the idea, proclaiming "bravo to the brave!" Over in the Post, John Ivison takes a "propane tank is half full" approach, in a thumbs down review. He also either leaks the Conservatives' "cap and trade policy" or is as confused by all the different plans floating around as everyone else. 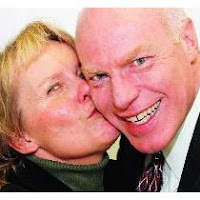 The Canwest story describes Harper as "uncharacteristically emotional as his voice rose to condemn Dion's plan". So now we know the two things the PM feels passionately about – hockey and high gas prices. The Toronto Sun editorial calls it “too good to be true”…somehow I don’t think they meant that as a compliment. Alberta politicians show great restraint in not actually saying the letters "NEP", although they allude to it. The columnists out west are unable to maintain the same self-restraint. Neither is the Prime Minister. Coyne makes some valid points on this plan's revenue non-neutrality, but the crux of it is he would have rather seen rich people got the tax breaks. Maybe that makes some economic sense, but politically? This thing is hard enough to sell on its own, without it being spun as a reverse-Robin Hood scheme. Wells points out all the beer and popcorn which can be bought with the proposed $350 a year child tax credit and advises the grits to avoid making this a debate about revenue neutrality. Given that the Tories appear intent on making this all about revenue neutrality, that's a pretty good sign the Liberals should be focusing on something else (like the "make polluters pay" principle). Radwanski is glad that Dion is talking about something policy related, even if it's not exactly a "set-the-world-on-fire" (and tax the CO2 created from that fire?) policy. I agree. If the next election is about leadership, Dion will lose - so making it about policy isn't a bad strategy...unless that policy is deathly unpopular (see: faith-based schools, funding of). Kinsella says it isn't a "total disaster", and links to a Liberal promotional video that plays upon the desires of Canadians for a bold, national plan to fight climate change. Libloggers generally think this is the greatest thing since the tax on sliced bread, and the Blogging Tories are too busy thinking about spanking senators to really notice it. As for my take? It’s a good policy – most environmentalists and economists will tell you that. It’s also a fair policy since it puts a realistic price on a negative externality. Under this plan, some people would be better off and some would be worse off, despite what the hyper-partisans on both sides will argue. I don’t have a house or a car, and blogging isn’t an overly CO2 intensive hobby, so I suspect I’d gain – but other people will lose and some industries will be hit hard. And, yes, although Dion will dance around the issue, the price of gas will go up – duh. But people will be getting a lot of cash back to make up for it and gas should be more expensive. I think it’s debatable how much this will actually affect energy-consumption habits; people still drive despite a massive spike in gas prices and there aren’t really a lot of alternatives to home heating fuels. That said, putting a price on emissions acts as an incentive for alternative energy sources, and rising heating bills makes conserving energy and retrofitting homes more cost-effective. So, yeah, it’s something we should be doing. Politically-speaking, I’m not very high on it, but when politics in this country has turned into little more than schoolyard name calling, it’s nice to see politicians actually putting real ideas out there. CBC (and one presumes Elections Canada) seem to have most of the details in advance, but Dion will be making the official carbon tax announcement this morning. I’ll update this when he does but, for now, you can read the rumoured details here. UPDATE: The Green Shift website is now up and running, with the full plan details. Like all Canadians, I will be sure to read the 48 page handbook once I get an opportunity to but, for now, I will say that the "savings calculator" is a good way to simplify a colossally complicated plan. Knocking people up for donations is also a smart move. Ed Stelmach’s ambitious agenda of change (that works for Albertans!) has finally produced some tangible results, with this week’s announcement that Alberta will be changing it’s license plate logo. So the wild rose is out, and will be replaced by oily the splotch. No, just kidding – but that would have been fun, wouldn’t it? Instead “strong a free” will now don license plates, and the rocky mountains will replace the wild rose as the picture. Even though my choice of “Alberta: Go ahead, make my day” didn’t win, I can live with “strong and free”. Some are criticizing it as being “too American” but, well, the thing is a quote from the Canadian national anthem. So well done Ed - I salute you! I can only hope you will soon right the grave injustice that occured when rough fescue was named the official grass of Alberta. ...is an example of top notch journalism. Put in the time, do the research, cut through the spin. Very refreshing. Conceived in Tory focus group rooms, oily was born several weeks premature when Conservative strategists induced labour. Immediately, Oily became a child star and it wasn’t long before everyone, from Tory staffers to Jack Layton, were wearing oily merchandize and rattling off his catch phrase “Yoo-hoo: Hello! Over here!”. However a cloud (of smog?) hung over Oily’s career as accusations of bad business deals surfaced. Just a week old, Oily’s once promising career appears to be over, despite rumours of a comeback tour with Oily, Joe Camel, and Lenny the Led Paint Chip. For more on the saga of Oily the Splotch, Stephen Taylor provides some “insider” background, as does the Globe. "Gerbera daisies, peace lilies, and English ivy are good protection against benzene and trichloroethylene"
That, and 49 other helpful tips can be found here, courtesy of the Liberal Party of Canada. And while some will snicker, I think Canadians actually want to do "little things" like this to help the environment. Time for a Big Rock boycott? Some of the largest corporate Conservative donors include TransCanada Pipeline, which gave the maximum $15,000, and Big Rock Brewery and Enbridge Pipelines, which each gave more than $13,000. Oil and gas magnate Stanley A. Milner gave the largest personal donation at $15,000. So that’s what the “Eddies” are actually all about! OK, OK, maybe that's not a reason to boycott Big Rock, but perhaps a good reason for campaign finance reforms in Alberta, eh? Wow! The NDP leadership race is heating up! And holy crap, it’s gonna be a clash of the titans. Will Nash make a splash? Will delegates say no-no to DiNovo? Who will win? Can anyone else stand the suspense, or is it just me! 1. This Couillard thing keeps getting more and more intriguing, even two and a half weeks after the Minister's resignation. An aid in Michael Fortier's office is gone, after it's revealed he dated Couillard. And accusations of influence peddling are flying! Will the fun never end? 2. Does it make me a bad person to be glad that Pierre Polievre is in trouble? 3. Meet the new Judge Gomery - Jeffrey Oliphant. And it didn't take long for the first conflict of interest connection to emerge (I personally don't think it's a big deal that Mulroney appointed him, but I'll be curious to see if the opposition/media latch on to this at all). MSNBC has a fun online game, where they’ve bracketed 32 Democrats and Republicans and invited users to vote for a VP nominee. The Dems have just gotten underway, the Republicans are closing in on their final four. Which reminds me, it’s almost summer time, which means it’s time to start thinking about a bracket game to pass the time on this blog. Three years ago it was Greatest PM, two years back it was Greatest PM we never had, and last summer was Best Premier. Given some of the mad ballot stuffing we’ve seen in recent years, I suspect the theme is going to have to be relatively politically neutral or, at the very least, bracketed in a way to keep it interesting. Oily the splot may not air. While some will try to spin this as a Tory screw-up, as far as screw-ups go, getting a few days worth of wall-to-wall publicity for your ads at no cost isn't the worst screw-up a party can make. Anyone know what a front page colour ad on the Toronto Star is worth these days? A commercial slot during the CTV evening news? This is completely OT from politics (unless Denis Corderre opens his mouth again) but, as I guessed they would, TSN has swooped in and picked up the HNiC theme. Big score for them and a monumental **** up by the CBC - it's that simple. If the CBC guys want to redeem themselves a bit and keep the nostalgic aspects of Hockey Night alive, they should take this guy up on his offer. Myself, I think this version of the song would make an adequate replacement intro. CALL IN THE LAWYERS UPDATE: Here's a very interesting take on what we might be in store for - lawsuits, lawsuits everywhere! They defined Dion before the Liberals could and now the Tories have set out to define Dion's carbon tax before the Liberals can. Which is fair enough since Dion has yet to announce the specifics of his plan. In the story they quote Peter A. Nelson (yes, THE Peter A. Nelson), executive director of the Atlantic Provinces Trucking Association and self-proclaimed amateur economist. 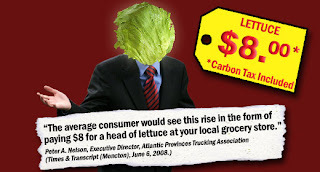 In it, Mr. Nelson predicts Dion's carbon tax will lead to $8 a head lettuce prices. Now, I noticed lettuce was $1.69 a head at Dominion on Saturday. Let's just say $2 to keep the numbers even. So, even if we forget about the portion of that cost that comes from growing the lettuce and store profits, transportation costs would have to quadruple in order for Nelson's prediction to come to pass. Of course, like I said - no details so I guess it's possible there's a $5.20 a litre gas tax in the plan, but I doubt it. But, whatever - no need to dwell on the juvenille antics of the official Tory website. More important is the mainstream ad campaign, which has a lot more meat on it (no pun intended). The ads will be running on gas pumps which is just freakin' brilliant in my opinion, with gas prices soaring. The ads themselves are a bit tacky, but should be effective at getting across the message the Tories want to get across. -Slamming (Mulroney's) "revenue neutral" GST. -A "tax tag" game which is, truth be told, pretty funny. They even tossed Cherniak on, ensuring the site will get a few more links. -"Do you think it's easy to load websites?" shows up on the screen as the site loads. I'll admit I laughed out loud at that one. Follow the link and you'll find 5 questions the Conservatives are "demanding" be answered. I agree -answers are needed. And with all these questions about the Liberal Party's involvement in Cadscam, I'm sure Conservatives everywhere will agree that the only reasonable course of action is a full blown inquiry! Right? I don’t generally take issue with politicians giving themselves pay raises – it’s tough work and we need to encourage the best and brightest to run. Alberta's premier and other senior elected officials will receive more than $1 million in severance pay when they retire, a taxpayers group said yesterday. Just days after Alberta Premier Ed Stelmach approved a hefty pay hike for himself and his 23 cabinet members, the Canadian Taxpayers Federation said the raises aren't the end of the big bucks some are set to receive. "It's significant dollars," said Scott Hennig, Alberta federation director. "The severance breaking seven digits - it's certainly the most generous severance in all of Canada." Speaker Ken Kowalski is expected to receive severance totalling more than $1.3 million if he retires in the next four years, according to the federation. The jump in severance pay comes after Stelmach gave himself a $54,000 salary increase, for an annual salary of $213,000, making him the highest paid premier in Canada. Natynczyk – A great scrabble score, a great general? Lieutenant-General Walter Natynczyk will succeed charismatic and outspoken General Rick Hillier as the head of the Canadian Forces, the Harper government has announced. I'd Rather Give Up "O Canada"
One of this country's most familiar tunes may have been heard on CBC-TV for the last time Wednesday night when the Detroit Red Wings defeated the Pittsburgh Penguins and won the 2008 Stanley Cup. The Toronto agency representing the composer of the theme tune for Hockey Night in Canada says the CBC has declined to enter into a new licensing agreement for the song for next NHL season. A news release posted on the website of Copyright Music & Visuals quotes company president John Ciccone as saying the CBC's licence agreement for the hockey theme song ended with the Stanley Cup final. So they'll pay Don Cherry $700,000 a year to make bigoted comments for 2 minutes every week, but won't dish out $500 a night for the most beloved tune in Canada? I hate to sound like a Conservative lackey here, but SHAME ON THE CBC! OTTAWA - Conservative Heritage Minister Josée Verner must stand up for one of Canada's most famous musical traditions and do what she can to ensure the CBC keeps the Hockey Night in Canada musical theme, Liberal Heritage Critic Denis Coderre said today. "The Hockey Night in Canada theme is a part of Canada's culture that goes beyond sport," said M. Coderre. "This is a great opportunity for the Heritage Minister to finally get off the bench by defending an important Canadian tradition." OTTAWA–Finance Minister Jim Flaherty should be fired in the wake of General Motors saying it is closing its Oshawa truck plant, Liberal Leader Stéphane Dion says. GM's announcement that it will shut the plant in 2009, throwing 2,000 people out of work, caused an uproar in both the House of Commons and the Ontario Legislature yesterday. "The finance minister told the world not to invest in Ontario," Dion said in the Commons. "Unfortunately, General Motors took his advice and the workers and their families are paying the price. Any finance minister who discourages investment and job growth is not fit to be finance minister." Harper shrugged off the planned layoffs, saying it was the result of "a couple of one-time events" in an otherwise healthy economy. You know, it’s not necessary to call for a Minister to resign every single time something goes wrong. Yet, we seem to get at least a dozen demands along those lines every year. Radwanski had a good take on this feigned fury earlier this spring (the point stands even though the post was about Bernier). Back to Flaherty. Yes, his “last place to invest” comments were stupid. But does anyone really think that was the reason GM closed up shop? What is interesting amid these calls for Flaherty’s resignation is that the Tories aren’t trotting out the “blame Dalton” talking points on this one, preferring instead to downplay the seriousness of the economic slump. 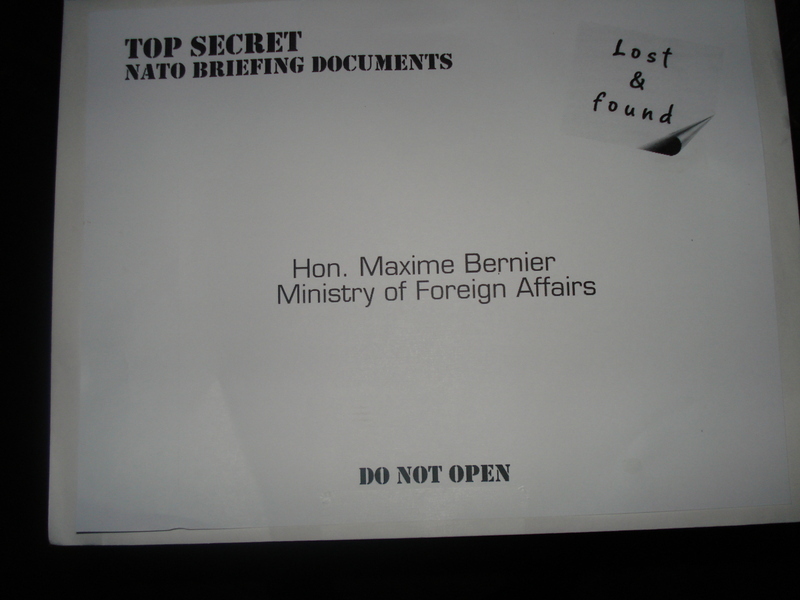 Those young-Liberal pranksters are at it again, circulating this photo as something spotted in the lost and found at Pier 21, a local Ottawa nightclub. "The Liberal Party has been caught using a doctored tape to make serious criminal accusations against the Prime Minister of Canada on the eve of an expected election campaign," said Tory MP James Moore. Woah. Did anyone else just have a weird flashback to the Gurmant Grewal incident which, I might add, happened the exact same time as the stuff being mentioned above. Weird. Kady O'Malley offers a delightfully cynical run-down of the Tory tape tampering allegations here. It's a little curious that Moore and friends aren't willing to explain in what way or by who (whom? any grammar nazis out there who can clarify?) the tapes were edited. Moore was also surprisingly silent, even by Conservative backbencher standards, when asked if Harper actually said the big "financial considerations" line. Actually no, I don’t find that surprising at all, because if Harper hadn’t spoken those words, his immediate reaction when the tape surfaced would have been “what the hell? I never said that!”. I imagine this is related to the libel suit against Dion but, even then, I don't really see why the Tories would want to resurrect this beast given that no one has really cared about this ever since the RCMP said they wouldn't press any charges. They’ve pretty much invited a few days of questions on what specifically was altered – and once they make that known, they’ll be de facto admitting that the rest of the tape's content is genuine. Tonight will be “clinching night” for Obama, effectively ending the most exciting nomination race in US history. Whether or not Hillary acknowledges that remains to be seen. I’ll have updates here throughout the evening as the results roll in and the speeches are made. One expects talk will now turn towards finding a vice-presidential nominee for Obama (and McCain of course). While conventional wisdom would tell him to stay the hell away from her, there is an argument to be made for Obama choosing Hillary, simply to ensure the party stays united. One imagines there will also be a lot of buzz around high profile names like Edwards, Richardson, and Clark. But it might very well be a sleeper like Evan Bayh, Brian Schweitzer, or Kathleen Sebelius who gets the prize. Or any of the other hundred or so names I’ve failled to mention. Select Smart has a fun quiz where you fill out the VP’s bio and they suggest the names – I put myself into Obama’s shoes, and they recommended Jim Webb based on my criteria. "YES HE DID" UPDATE: CNN projects it. Hillary says no decision tonight. 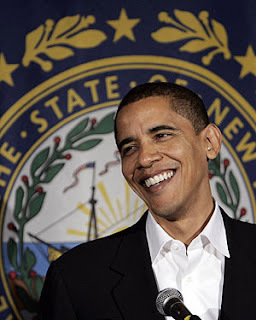 Obama: "I will be the democratic party nominee"
A great final 2 minutes to Obama's speech. So let's get the party started - Obama v McCain...should be one heck of a race. VEEPDATE: CNN and the online markets weigh in on VP speculation. ...announces her retirement from politics. Being a former NDP leader, one presumes this is just to set up her "comeback" in 5 or 10 years. UPDATE: Rumours abound about possible NDP candidates. QUEBEC CITY–An Ontario-Quebec accord on climate change has yet to be officially unveiled, but Ottawa is already slamming it as nothing more than "smoke and mirrors." Premier Dalton McGuinty and Quebec Premier Jean Charest are to release their proposal for an inter-provincial carbon-trading market at a joint meeting of their cabinets here today. Under this so-called cap-and-trade system, companies that produce fewer greenhouse gas emissions than their caps permit could sell their unused quota on an open market to big polluting firms that exceed their emissions cap. The leaders of Canada's two largest provinces say their historic deal proves they are leading the fight to save the environment, and they made it clear they believe the federal government is dragging its feet on climate change. But federal Environment Minister John Baird yesterday dismissed the premiers' proposal, telling the Star the scheme is virtually meaningless without an enforcement component to punish polluters. But Baird, speaking from Ottawa, said that "a trading regime is only good if you have laws forcing big polluters to reduce their greenhouse gas emissions." "This could give big polluters another three or four years before they're forced to do anything," he said, urging the provinces to buy into federal proposals intended to cut Canada's greenhouse gas emissions to 20 per cent below 2006 levels by 2020 and penalize scofflaws. For those who missed Baird’s QP interview on Sunday, it was truly something else. In it, he praised Mike Harris and the Alberta government for the their efforts to cut emissions, while repeatedly lashing out at McGuinty and Charest. All of this on an issue he could have dismissed with a “this isn’t the most effective way to go about it in our opinion, but we welcome any moves the Premiers make to reduce their greenhouse gas emissions”. When people look back on it, Stelmach’s crushing win on March 3rd, may prove to be a blessing a disguise, if only because it has made those in opposition serious about forming government (and, to a lesser extent, the NDP), take a long, hard look inwards. And because of that, we’re seeing a lot of talk about the future of the Alberta Liberal Party. The latest proposal to be put forward is the “New Liberal” document and this one deserves closer scrutiny than a lot of other ideas out there because it's being pushed by a major ALP leadership contender. The “New Liberal” proposal, despite recognizing a need for change, rejects what they call the “extreme options” – a merger with the NDP, a name change, or the creation of a new party. 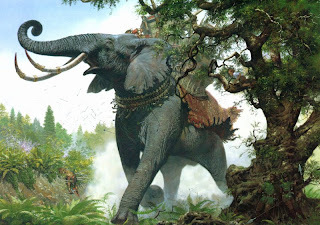 A lot of reasons, some valid and some a little puzzling, for opposing a name change are presented and I think I’ll save that topic for a post of it’s own on a slow summer news week (when, you know, we’re all tired of making fun of poor Maxime Bernier). Instead, the idea is to copy the “New Labour” movement and re-brand the party as “New Liberals”. And, really, if you’re going to reject the “extreme” proposals, this definitely seems like the best alternative since it provides a clear impetus to change the party’s message and policy. And they even toss a bone to the radical reformers by agreeing to change the party colours, if not the name. So what would the “new Liberal” party represent? Well, on that topic, this plan is silent on specifics. That’s not a criticism, since I don’t think it’s the role of a document like this to outline a new platform and, as soon as you start talking about policy, you start to forget about the big picture stuff. The document does recognize the need to start from scratch, find out what Albertans want, and think long term. The idea is to be proactive rather than reactive. So what do I think? Well, if the dramatic options are rejected, this seems like the best course of action. I really like the language in the document about changing the message, ending the “martyr complex”, listening to the will of Albertans, and not making excuses for the party’s failings. And regardless of whether or not the “new Liberal” approach is accepted, there are some really good organizational suggestions for party building that should be put into place. Really good. Common sense, but things any modern party wanting to form government should already be doing. However, my biggest fear is that this movement could eventually peter out into “status-quo change” like so many well intentioned ideas often do. Rebranding is called the “final step” on the renewal process and the rebranding suggestion of trying to “out-Liberal” the federal Liberals is…well…I wouldn’t call it a recipe for disaster, but it sure has some of the ingredients of disaster in it. If the “New Liberal” movement actually takes a page from New Labour by morphing the ALP into a centre-right, fiscally conservative party that Progressive Conservatives are comfortable with, then it might just be the answer. However, if the party is reluctant to change platform and philosophy in order to appeal to a larger tent, then it won’t amount to much more than a new buzzword. The Democrats have reached a compromise, giving Florida and Michigan half votes and splitting the Michigan delegation 69-59 in favour of Clinton. Immediately, some Clinton supporters and organizers have begun to raise the spectre of a challenge to this ruling at the convention - presumably to get an extra 4 half votes out of Michigan, which would cut Obama's lead from 174 to 172. With the primary calender wrapping up this week and most super delegates likely to make their choice public soon afterwards, I suspect this is more for show from the Clinton campaign and we'll soon see some sort of recognition on her part that Obama will be the nominee.